Schenectady’s Cameron Kiser was astonished by the big crowd at Friday’s March for Life in Washington, D.C.
About 200 people from the Capital Region were among the thousands who participated in the 45th annual march, an anti-abortion rally always held around the anniversary of the 1973 Roe v. Wade decision — a decision that recognized a legal right to abortion. The 17-student Notre Dame-Bishop Gibbons delegation left Albany late Thursday night on a Yankee Trails charter bus and arrived in Washington on Friday at about 6:30 a.m. The schedule included a youth rally and Mass; a visit to the National Mall; a televised speech by President Donald Trump; in-person speeches by people such as House Speaker Paul Ryan and Pam Tebow (mother of athlete Tim Tebow); and the afternoon march up Constitution Avenue to the Supreme Court and Capitol buildings. “It was my first time being in something like this,” said ND-BG sophomore Joey Tortello, 16, of Albany, in a cellphone interview from the bus as he and other marchers prepared for their return to Albany. Some ND-BG parents also made the trip. Mike Marrone of Johnstown marched with sons Jacob, 17, a senior, and Ethan, 15, a sophomore. Daughter Julia, 18, who graduated from the high school in 2017 and is now a freshman at Fulton-Montgomery Community College, also was on the family team. The Roman Catholic Diocese of Albany said several buses sponsored by local parishes — including St. Clement’s in Saratoga Springs, Corpus Christi in Round Lake and Christ the King in Albany — traveled to Washington. Students from Saratoga Central Catholic High School and Catholic Central in Troy also marched. “These are kids who made a really long trip to stand up for something they believed in, not just as Catholics but as citizens of the world,” said Mary DeTurris Poust, director of communications for the diocese. Tatianna Myers, 18, who also graduated from ND-BG in 2017 and now attends the College of St. Rose in Albany, said she marched last year and loved the atmosphere. Kathy Tobin of Schenectady, a guidance administrative assistant at ND-BG and a trip chaperone, said school representatives have participated in past marches. 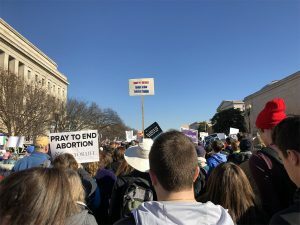 “We just wanted them to experience seeing other youth, so many standing up for life, and see other youth be on fire with the Catholic faith,” Tobin said.